Ciúin Tracey is a freelance photographer from Dublin, Ireland who works mainly in fashion and commercial photography, with these genres influencing heavily upon her more personal fine art work. She has exhibited work in many galleries, including The Gallery of Photography, the RDS and Farmleigh House. She has also been printed in multiple publications, and is currently the resident photographer in Shutterbug, Kilkenny. Her work can be seen in the permanent collections of Olivier Cornet, Fire and Dublin Ink. Tracey is interested in using the techniques gained through fashion and studio photography, to create photographic series that explore the person’s relationship with their bodies in relation to the ideals set forth by modern media stereotypes. Tracey is currently working on an expansion of her graduation series entitled The Tyranny of Beauty. The Tyranny of Beauty is a photographic narrative that explores the representation of the body and the psychological impact of the promotion of certain physical ideals in the contemporary mediasphere. The series examines peoples’ relationships with their physical being and how often, in the search for the perfect or ‘utopian’ body, a dystopian reality is created as a result of unnatural aims and expectations. As an exploration of the photographic studio and the codes surrounding the body of the model, the role of gesture and pose and the allegory of still life, these photographs represent related body-based and psychological states. 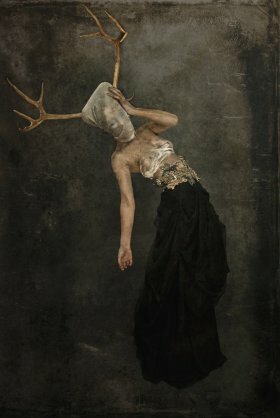 Through the dark colour palette and the claustrophobic nature of the frame, the audience is confronted with a construction of dysfunction, which may be read as a kind of distortion and dismorphia produced by the excess of visual images in everyday life dictating unhealthy body ideals. These photographs propose another vantage point on a much-discussed social issue that affects men and women of all ages.